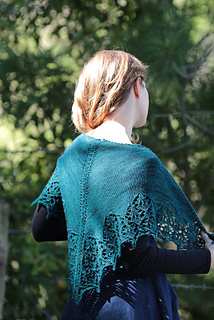 Treeangle is a top-down triangle inspired by many magical hours walking in tall forests. 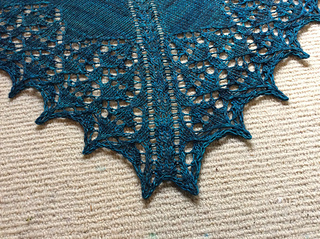 It has a lightly cabled lace, with optional subtle beading, and an unusually constructed trunk for a spine. The cables remind me of the branches and vines of forest growth, and the leaves have the spiky look of holly or pin oak from some angles, and from others, the round curves of birch or pear leaves. 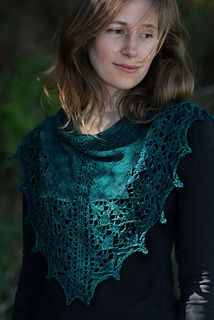 This design is a collaboration with Naomi Parkhurst of Gannet Designs, using a stitch pattern she has created with the word Tree encoded into the placement of the yarn overs. 3.75mm needles (US size 5) were used for my sample in Madelinetosh Tosh Merino Light, however because the pattern can adapt to other yarn weights, please adjust your needle size to suit your particular yarn and preferred fabric density. 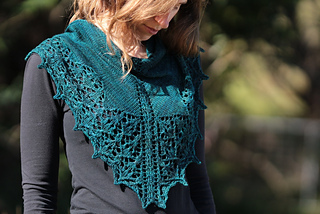 Shawl can be worked entirely from the written pattern, or from the charts with some notes.